Home › Buffalo Vol. 5, Shirt 5: "Clinched"
Buffalo Vol. 5, Shirt 5: "Clinched"
At last, after all these years... it's over. Available EXCLUSIVELY ONLINE through January 14th, then it's gone. $8 from every shirt sold will be donated to Tristan Thompson. Tim and Ashley had Tristan in April of 2016. Right from birth Tristan has had a tough road, as doctors worked to figure out what was wrong. They originally thought he had food allergies but after several visits to the hospital, one of the doctors at Strong decided to test Tristan for CGD "just to rule it out". Sure enough, it came back positive, and there was finally an answer. Tristan was diagnosed with CGD (Chronic Granulomatous Disease) in December of 2016. CGD is a rare disease that affects 1 in 250,000 births in the U.S. each year. The only potential cure is a stem cell/bone marrow transplant. Tristan began the stem cell/bone marrow transplant process on July 17th, 2017 at the Children's Hospital of Philadelphia. 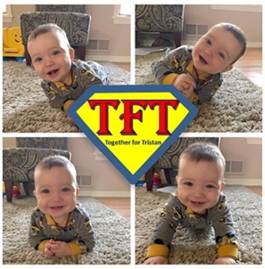 Once the transplant process is completed, Tristan will have to travel back and forth the first few years after the transplant to see his doctors, and will have follow ups annually for the rest of his life. Located within the beautiful town of Holly Springs minutes from the NC highway 55 bypass, Massage Ingenuity is the perfect destination to relax and rejuvenate, soothe what ails you, and find that blissful moment of peace. Come experience our serene ambiance and see why we have been rated #1 in massage therapy in Holly Springs. While serving our wonderful town and the surrounding communities, our clients travel from all over North Carolina including Fuquay-Varina, Apex, Cary, Raleigh, Durham, Lillington, and even as far as Greensboro.